I made mechanical reverse polarity protection ring. I cut a piece of plastic and thinned to fit. The height of the brass ring is 1.5mm and thickness of plastic is 1.8mm. I did not use any glue, just used a little more pressure to get plastic into the position. 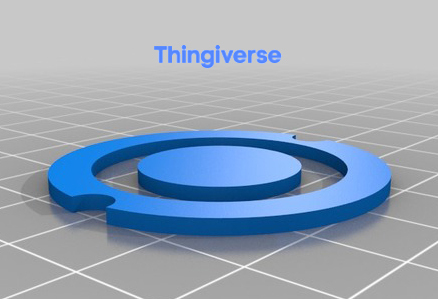 For those who have access to the 3D printer I have made a 3d model. I did all this because I wanted bypass spring. Safety in the first place. I do not want to see a magic smoke. 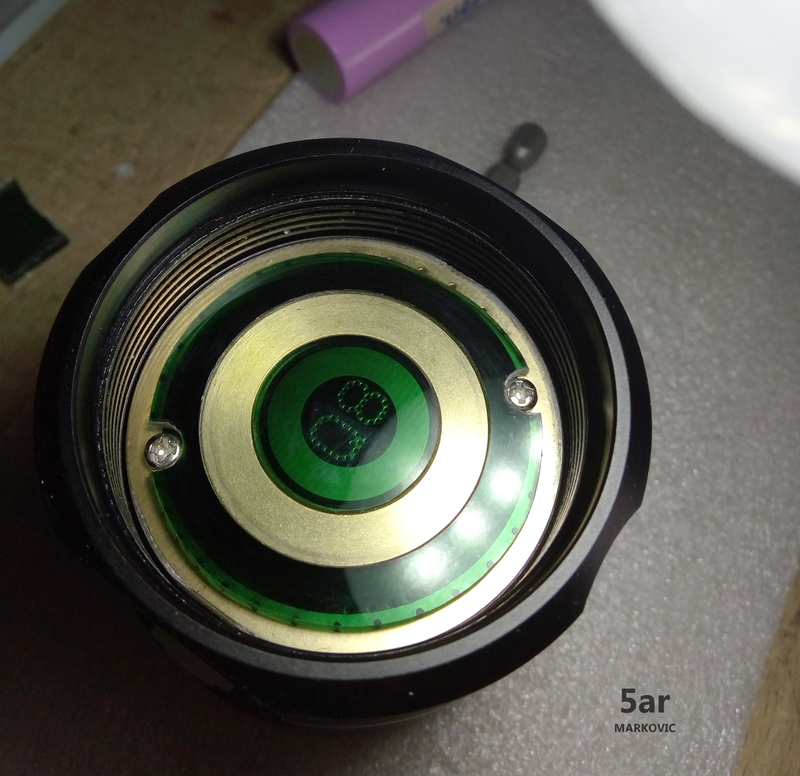 I am trying to make a lantern extension for the Q8, does someone knows the thread size of the bezel? Good Job 5ar!!! I like it! What plastic did you use? Can someone make one for me if you have a 3d printer? Protection ring or latern extention? But my PM is open for any custom drawings. I made mechanical reverse polarity protection ring. I cut a piece of plastic and thinned to fit. The button top diameter of my older 30Q from Banggood is about 8mm though – so I fear your ring won’t fit all button tops. The button top diameter of my older 30Q from Banggood is about 8mm though - so I fear your ring won't fit all button tops. You're right. My batteries have a 5mm button top diameter and everything is fit. I did a change for a larger diameter of the top button. Thank you. I use colored plexiglass. I’ve seen a lot of super impressive lumen numbers using fresh cells at turn on and 30 seconds… even from mostly stock lights. 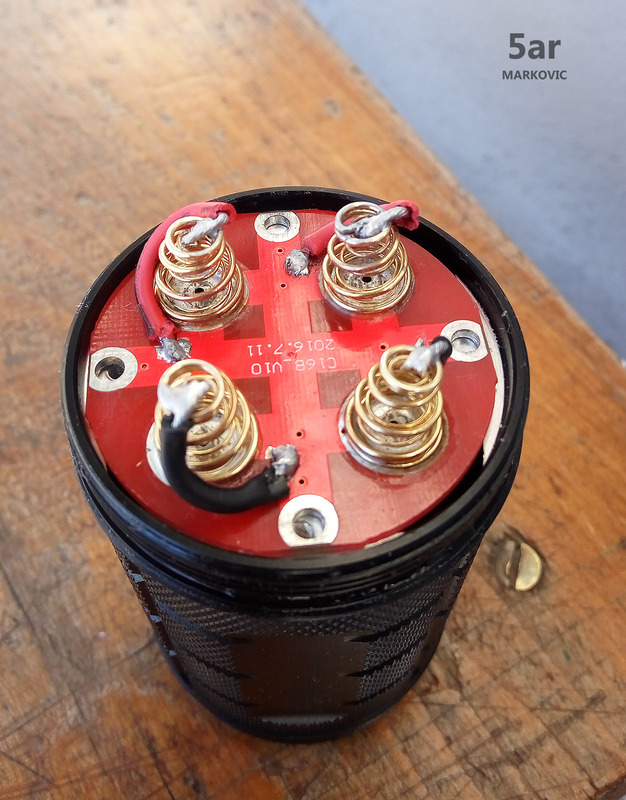 Has anyone measured lumen output with 30Qs once the cells are more depleted… say 3.2ish volts? Or is there a way to extrapolate lumen output from the data that has already been collected? I've seen a lot of super impressive lumen numbers using fresh cells at turn on and 30 seconds... even from mostly stock lights. Has anyone measured lumen output with 30Qs once the cells are more depleted... say 3.2ish volts? Or is there a way to extrapolate lumen output from the data that has already been collected? Thanks! Well I this afternoon cleaned up properly & modded both my Q8“s. First I sanded the top of the battery tube where it makes contact with the ground ring. Then I cleaned & very lightly sanded both the positive & negative contact rings, after ensuring the board was sat flat, & where the screw holes in the tail board contact the battery tube. I then tinned the screw holes in the tail board where they contact the battery tube. Lastly I swapped the tail board screws for brass ones. All this gave me an increase of about 400 lumens from my previous stock reading taking it up to 5860 on start up on freshly charged 30Q BT“s at 4.20v. I then removed the tail board again, ripped out the small thin inner springs (just pulled them out quite easily) & bypassed the springs with 20awg silicon wire soldered to the board by scraping some of the red coating off halfway between the spring & screw hole. This resulted in a start up reading of 7650 lumens in my light tube & 6950 at 30 seconds again on 30Q BT“s at 4.20v after 30 seconds. Fun to see the output jump like that after a bit of personal involvement, isn’t it? I’d buy two! I don’t know anyone with a 3D printer, though they seem widely available. Why buy them? Because I know some day, down the line, somebody is going to get hold of my flashlights and not know what’s not safe to do with them. Yeah, I know about making things idiot-proof (Nature is always coming up with more clever idiots ….). But I think it’s important to try. The factory screws sit below the level of the positive contact plate. Nuff said. I had previously only seen a big jump like this when I “solder blobbed” the S70 (not that I have done much “modding” previously). Does this show that the ground path on the Q8 is not very good as stock & in particular the springs are giving a lot of resistance ? Or does it show that the Q8 is easily modd“able as was one of the design parameters ? Sort of a combination of those things Ian, the springs are typically gold plated steel for mechanical function, so the bypass is always a gain and in the case of 4 cells and 4 emitters it turns into a large gain. Not that factory lights are bad for having springs made of steel but in this case the ease of modification makes it a big plus. Welcome to the world of improved EDC! In the fall and winter with a jacket or coat, the Q8 is handy enough. When it’s hot out and we’re wearing T-shirt and shorts, well, the Q8 is a bit more difficult to have tagging along. We had a brief taste of cooler fall weather but are back up in the mid 80’s as usual. So it’s T-Shirt and shorts with sandals weather in November. Nothing new there. Need to figure out a good lanyard mount for the tail cap…..
We don“t normally get mid 80“s in the height of summer here in the UK, maybe 1 or 2 days a year are that temperature & not every year. It is Autumn here now (fall ?) & the last 6 or 7 nights we have had frosts (temp below 32f) & maybe 50f in the day. Only good thing is that at the moment it is dark from about 5pm to 7am so 14 hours of dark. Dark at 3 in the afternoon? We’re much more likely to be playing with the kids toys outside on Christmas day in shorts and shirt sleeves than to have snow, very seldom does it get snowy here… an ice storm once in a while in late Jan or early Feb, but it can be icy one day and 90 the next, no joke! 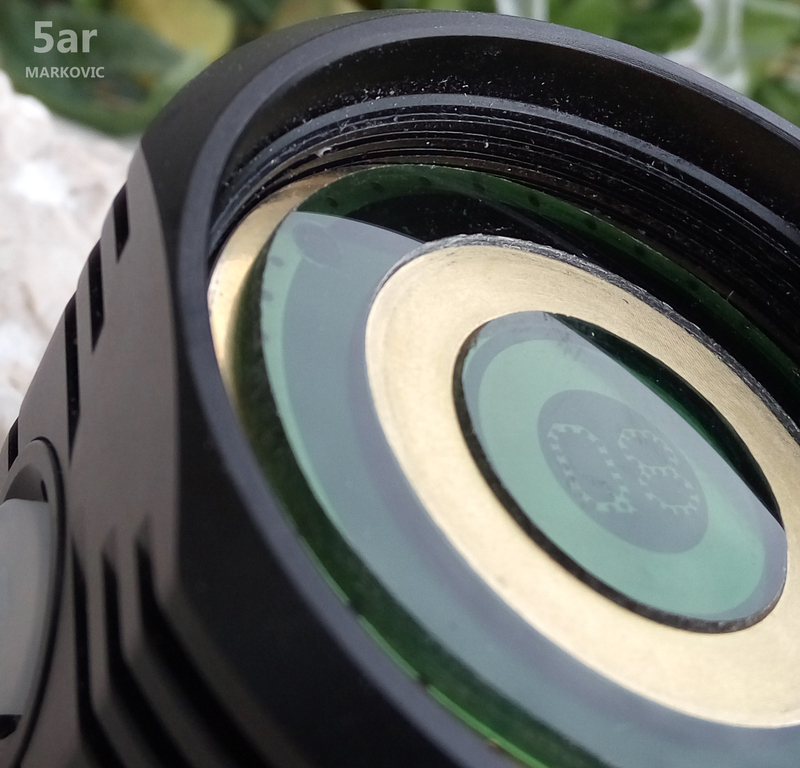 The plastic rings for reverse polarity protection are a good idea, something I suggested a long time ago (at least the inner ring), but the brass ring on the driver is too narrow in diameter. Samsung 30Q “button tops” from Bangood for example only overlap this ring at the outermost edge by maybe a mm, or perhaps 1.5. So it might not work for these. The inner piece could work against a reversed cell, but the outer ring might, I think, just prevent the cells from making contact in normal conditions, i.e. a fail. 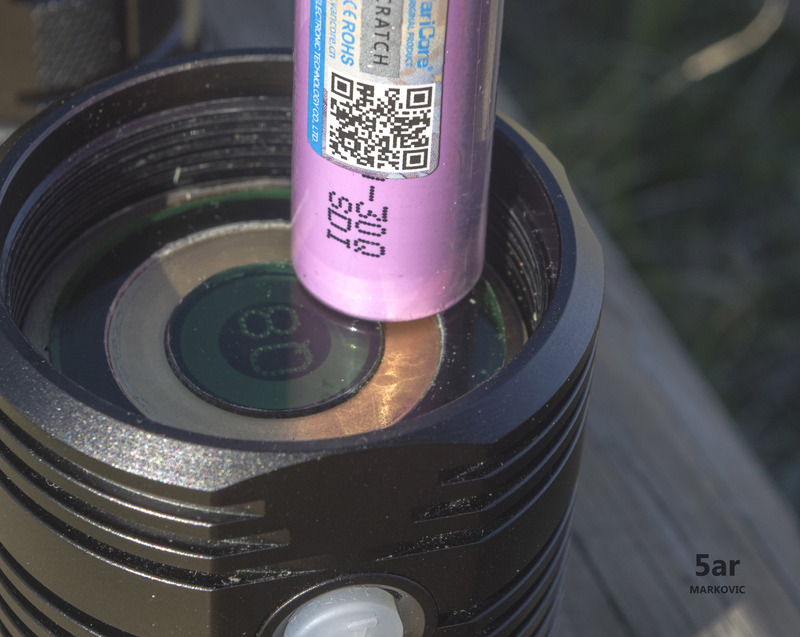 There does seem to be a disconnect (not a pun) between the actual battery arrangements (radius) in the tube, and the contact surface (brass ring) on the driver. They don’t really match do they ? Actually hardly at all (brass ring too narrow, cell tops (particularly when solder-blobbed) too far apart. Even with BG “wide flat button tops” they only touch the outer periphery of the brass ring by maybe 1.5mm, judged by witness marks. Solder blobbed things only just touch the very outer edge and maybe could be a bit perilously close to the two driver screws, in the limit. And the battery tube only just contacts the driver PCB at the outermost edge,by less than a mm, after a bit of adjustment, at least in mine. Just saying, it is what it is, it does seem to work well, regardless. I’ve seen a lot of super impressive lumen numbers using fresh cells at turn on and 30 seconds… even from mostly stock lights. Has anyone measured lumen output with 30Qs once the cells are more depleted… say 3.2ish volts? Or is there a way to extrapolate lumen output from the data that has already been collected? Thanks! Awesome! Thanks! 3000 lumens is amazing for 3.3V cells. I dont understand all this hand measures and etc. Since Miller had shared 3d model files with pdf drawings, you can easily check any dimensions. Centers of cell holes are laying on 27mm diameter. If hole is 19mm and cell is 18mm, we have 1mm gap to the both inside and outside directions. In my experience cells always go outside, so lets say that centers of non-protected cells are laying on 28mm diameter. Yes, this is just 1.5mm overlap, but dont forget to add half of button width to this measurement. I.e. with 8mm button top you actualy have 8/2+1.5=5.5mm overlap. I think head with driver place, and battery tube have ideal central alignment, the only problems may be caused by bad driver ring alignment. Both inner and outer diameters of ring dont match driver pcb mask, that why most driver ring have 1-2mm offset. I got 30Q buttom tops from an european seller with different button caps. The (not completely) flat top of the caps has a diameter of only 3 mm. This caps seem also weekly bonded, meanwhile one cell lost its cap already. Not nice if this had happened inside the light. big question is: which european seller? Well, I’m sorry, but I can’t find the bill and don’t want to blame the wrong seller. When ordering lithium cells in Europe I only use 2 well known stores, so it must have been one of them. Another picture: on the left the good old Banggood 30Q with solid button cap, next one of my new cells with cap still in place, and on the right the cell from the same batch with its lost cap. The Banggood button top cell has an additional clear shrink wrap layer, which should hold the cap in place even when it gets lose (I guess). I’ve got the same button tops, but on Sony VTC6. I’ve ordered them from batterijservice.nl, but it looks like Nkon sells the exact same button tops. I dont understand all this hand measures and etc. 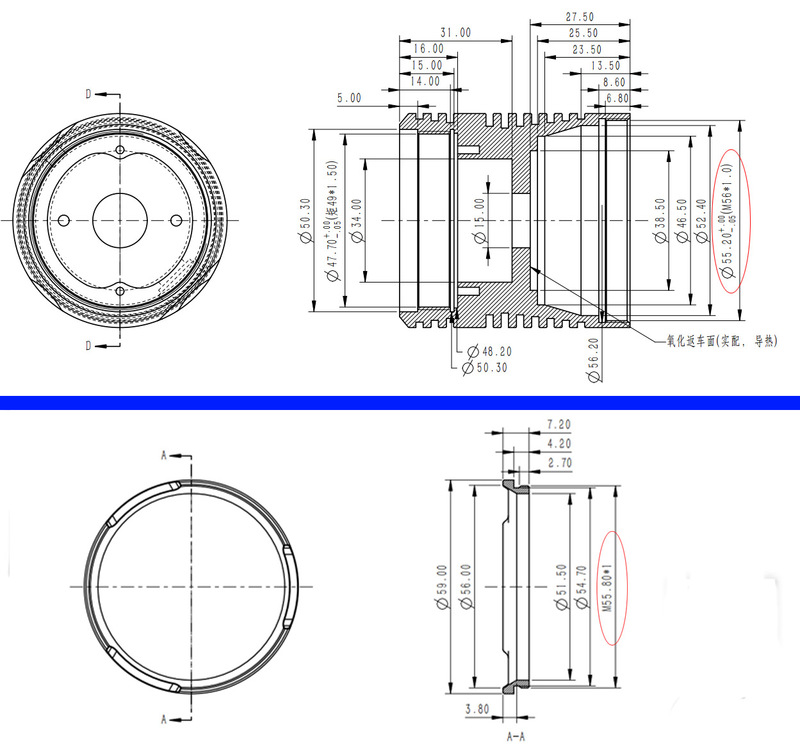 Since Miller had shared 3d model files with pdf drawings, you can easily check any dimensions. Centers of cell holes are laying on 27mm diameter. If hole is 19mm and cell is 18mm, we have 1mm gap to the both inside and outside directions. In my experience cells always go outside, so lets say that centers of non-protected cells are laying on 28mm diameter. Yes, this is just 1.5mm overlap, but dont forget to add half of button width to this measurement. I.e. with 8mm button top you actualy have 8/2+1.5=5.5mm overlap. I think head with driver place, and battery tube have ideal central alignment, the only problems may be caused by bad driver ring alignment. Both inner and outer diameters of ring dont match driver pcb mask, that why most driver ring have 1-2mm offset. I measured my torch, and agree with your figures. The cell holes in the tube go all the way to the edge, 46mm in my case. My un-protected 30Qs are 18.5mm diameter. The contact surface (the flat bit, not the total diameter) of the wide flat buttons on them is 6mm diameter. The brass ring is 31mm dia. 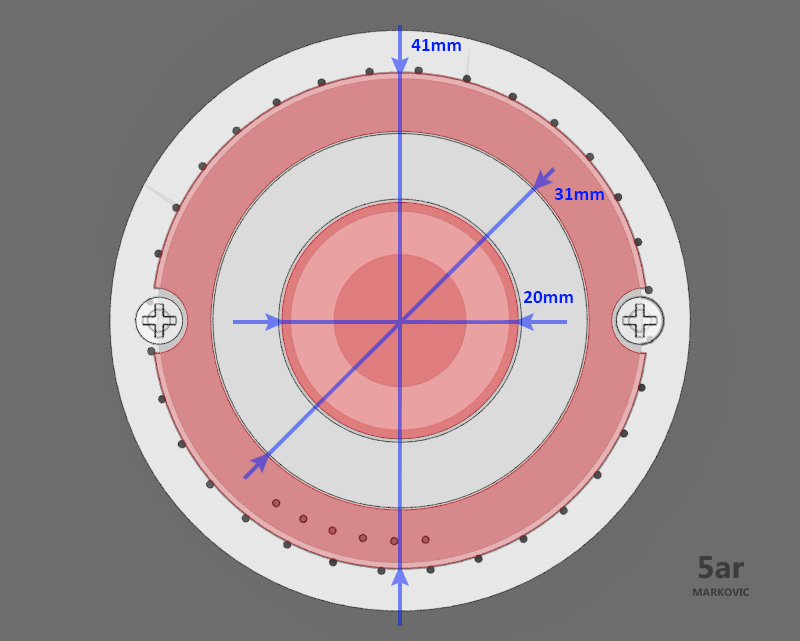 So when the cells are fitted and laying against the outer part of the tube, the centre of the buttons is on a diameter of 27.5mm, overlapping the brass ring by only 1.75mm. The wide buttons increase the overlap by 3mm to 4.75mm which is fine. provided the brass ring is centred. Mine is off by about one mm so worst case, the overlap will be reduced accordingly, for one cell. 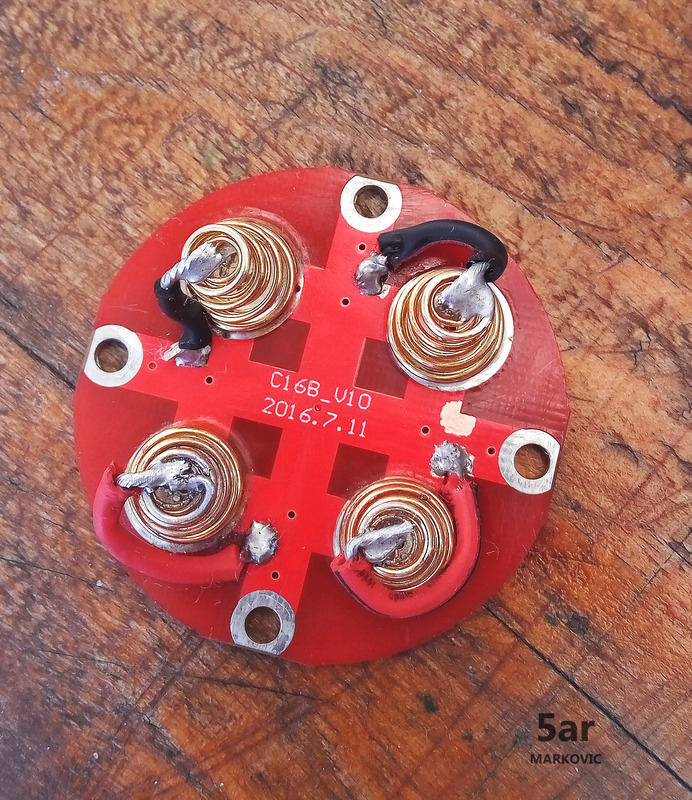 However for my solder-blobbed cells, which are 18mm diameter, I have filed the top of the blobs flat to create a contact surface of about 3.5mm diameter. Before I flattened them, the rounded blobs were effectively a point contact. With these measurements I now have 3.25mm overlap, minus the eccentricity of my brass ring. Before I filed them there was just 1.5mm of overlap, assuming the blobs were all perfectly centred (they weren’t) which I considered too little, and the soft solder was showing rapid wear. The bottom line is that yes there is overlap but it can be rather slim in the worst cases. Wide flat button tops seem fine, but if solder-blobbing you might want to consider filing flats on the blobs to gain a little more contact area and wear surface. I don’t have any narrow button tops to measure.